The use of medical electrodes to transfer the current energy into the electric energy in the body, which helps in detecting a large number of diseases has supported the growth of the medical electrodes market in the last few years. The rising developments and advancements in this field is another major factor that is predicted to accelerate the growth of the overall market in the coming years. According to the market research study by Transparency Market Research, in 2017, the global market for medical electrodes was worth US$641.3 mn and is projected to reach a value of US$857 mn by the end of 2022. The market is predicted to register a healthy 6.0% CAGR between 2017 and 2022. The increasing incidence of neurological and cardiovascular diseases is one of the major factors that is estimated to encourage the growth of the global medical electrodes market in the next few years. The rising investments by the key players for the research and development activities is projected to accelerate the growth of the overall market in the coming few years. In addition to this, the rising preference of consumers for ambulatory and home healthcare is estimated to generate promising growth opportunities for the market players in the next few years. On the flip side, the lack of knowledge among people regarding the availability of these technologies, especially in developing economies is likely to hamper the growth of the overall market in the next few years. Nonetheless, the rising trend of medical tourism is projected to enhance the growth of the overall market in the near future. Moreover, the increasing popularity of nanotechnology is expected to support the growth of the medical electrodes market in the next few years. Among the key regional segments, North America is projected to remain in the leading position in the next few years, accounting for a large share of the overall market. The presence of several leading players is one of the key factors estimated to encourage the growth of this region in the next few years. In addition to this, the rising research and development activities and the rising focus of the key players on the development of the new product are further projected to accelerate the growth of the medical electrodes market across North America in the next few years. Furthermore, Europe and Asia Pacific is predicted to witness a healthy growth in the next few years. The global market for medical electrodes is competitive in nature with a large number of players operating in it. The level of fragmentation is estimated to rise significantly in the next few years, thanks to the rising number of player projected to enter the market in the next few years. 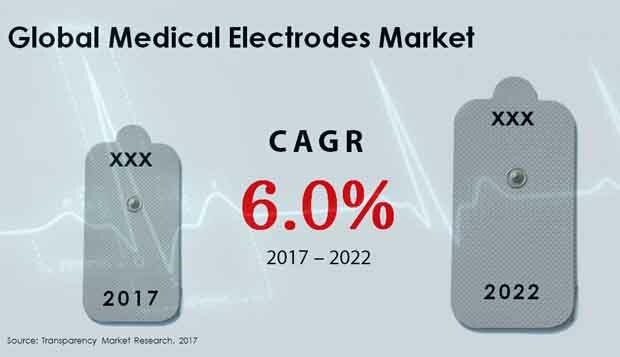 Some of the leading players in the medical electrodes market across the globe are Pacetronix Limited, Boston Scientific Corporation, Abbott Laboratories, Zoll Medical Corporation, Biotronik SE & Co. KG, Medtronic Plc., OSYPKA AG, Lepu Medical Technology, and Oscor Inc. The players are focusing on the research and development activities in order to maintain their dominance in the global market in the next few years. Medical electrodes passes on the current energy into electrical energy in the body and would thus be able to be utilized as a way of diagnosis of a several sicknesses. Medical electrodes are used as a known solution for the treatment of ocular, nervous, cardiovascular, and muscular illness and have developed the interest owing to their wide usage. The rise in number of cases with such illnesses diagnosed with the support of medical electrodes is probably going to boost up the worldwide medical electrodes market altogether in the coming years. The unfaltering global medicinal services industry uprise is probably going to help smoothen the improvement of the worldwide medical gadgets market as well in the coming years. This is credited to the rise in number of investments for smart and tech savvy items advancement, which will take into account the consistent change in the medical electrodes industry. The expanding frequency of illness caused due to change in life style in several regions of the world is an important factor in the development of the medical electrodes market. The pervasiveness of cardiovascular sicknesses has especially been on the rising in developed countries of Western Europe and North America, which is prompting the take-up of medical electrodes in the market. Medical electrodes are progressively being utilized for the finding of a various ailments, for example, cardiovascular sicknesses and neurophysical issues, and also for the treatment of neurological illnesses, for example Parkinson's and Alzheimer's. Medical electrodes work by moving current energy into electrical that can be utilized to recognize biomarkers left by various medical conditions. This is on the grounds that the precision achieved by medical electrodes has entitled them a fundamental part of several healthcare services. The expanding selection of gadgets to render human health and upgradation of medicinal services in a few regions of the world are some other major development factors of the worldwide medical electrodes market. Government activities are also embraced by private associations, which have been prompted strong reason behind the development of the healthcare division in a few economies of North America and Europe. Further, generous endeavors in various nations to incorporate solid diagnostic facilities inside the medicinal industry are probably going to surge the development of the market. The global medical electrodes market is bifurcated into Europe, North America, Asia Pacific, and the Middle East and Africa, based on geographical regions. The North America medical electrodes market was valued at US$219.7 mn in 2017 and is estimated to be worth US$297.9 mn by 2022 at a 6.3% CAGR therein. The solid advent of medical gadgets industry players in North America is probably going to enable the region to set up firm strength over the worldwide market in the coming years. The promising innovative work culture in the medical electrodes industry in this region is probably going to help the market, all things considered, as continuous item change is the significant development strategy for players in the worldwide medical gadgets market. Medtronic Plc., Boston Scientific Corporation, Lepu Medical Technology, OSYPKA AG, Pacetronix Limited, Abbott Laboratories, Oscor Inc., Biotronik SE & Co. KG, and Zoll Medical Corporation are some of the major players dominating the worldwide market of medical electrodes.